I love cooking! But as a mum even I tend to have the odd evening when I simply can’t bring myself to go into the kitchen. The day has been so hectic that even cooking a simple 30 minute meal feels like a mammoth task! I AM EXHAUSTED! On days like this, I like to keep cooking really simple. So instead of heading for JustEat, I pop into the kitchen for a few minutes (that I can manage), and cook my own 'fakeaway' from scratch. There really is nothing to it. It looks like a takeaway…. It tastes better than a takeaway…. AND it’s homemade!! The perfect family meal fakeaway! Supermarkets really have made life easier with their pre-cut vegetables, salad and easy access naan breads, they can save lots time after a busy day if you can’t face chopping so why not help yourself a little? Serves family of 3, or 4 with toddler. Total preparation time - 5 mins (30mins for marinating). Total cooking time – 20mins. Place all the marinade items into a bowl (except for the chicken) and stir to form the marinade. Then add the chicken cubes and combine well. Set aside and leave to marinate for a minimum of 30 minutes (go put your feet up). After the chicken has been well marinated, lay the pieces flat on a baking tray and bake in a pre-heated oven at 180C/ 400F/ Gas mark 6 for 15-20 mins until tender. If you want, you can turn up the heat towards the end for a couple of minutes to get that traditional chargrilled look to the chicken. Note: juices will leak from the chicken so you can either cook the chicken on a wire rack so the juices drop in a tray below, or pour out some of the water half way if the chicken is on a flat baking tray. Whilst the chicken is baking, make the mint sauce. Place both mint sauce ingredients in a bowl, combine and set aside. Finally, just before the chicken has finished cooking, warm the naans in the oven according to packet instructions. Serve to your family – yummy!! 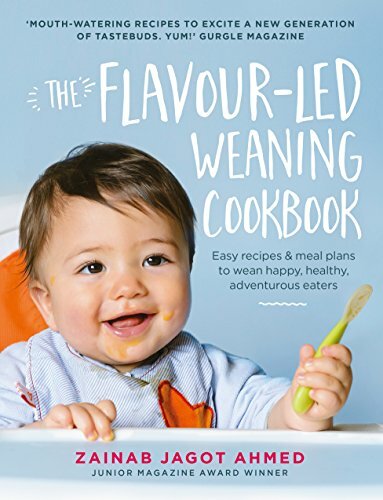 There are a few things you can do here to make this chicken tikka suitable for your little one. When combining the marinade ingredients, spoon out a little before you add extra salt or chilli powder and marinate a couple of chicken pieces separately. When cooked, serve the chicken tikka cubes as a finger food with a dollop of plain Greek yogurt as a substitute to the mint sauce. Or make your own baby-friendly mint sauce! Full fat greek yogurt combined with freshly chopped mint. Shred the chicken tikka cubes if necessary before serving and watch your little one ENJOY!! 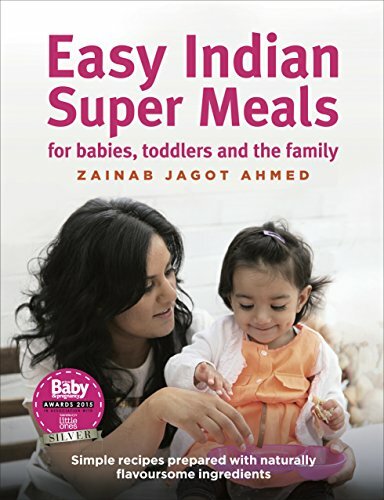 You can find more delicious weaning and family recipes in my cookbook - Easy Indian Super Meals for Babies, Toddlers and the Family - available to buy from Amazon.